Congratulations! After a lot of hustle and struggles, you have finally earned your first paycheck. So, now what is your next move? Where would you spend this money? Oh, that fancy watch you wanted to buy or a new Laptop with better performance? The way you invest your first paycheck will mold the future success for you. If you are investing it in enjoying and partying and taking blogging for granted, then you’re moving on a wrong track. 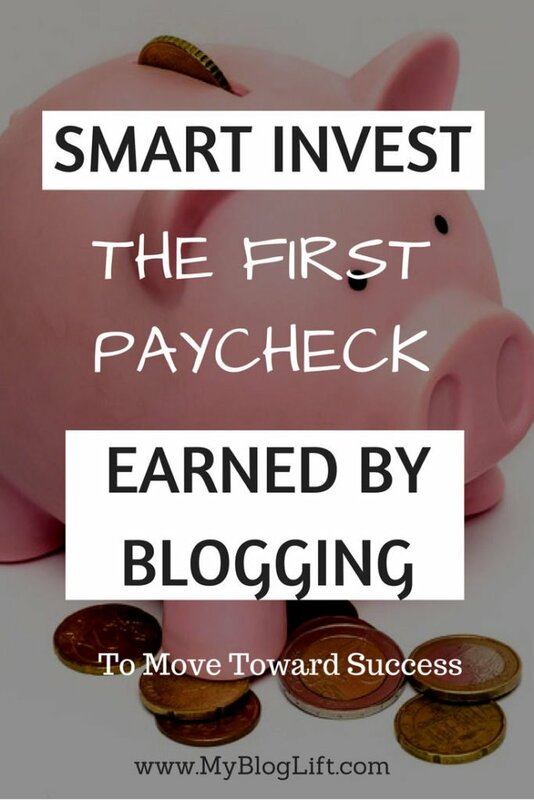 If you want better returns and more earnings in the coming months, then you need to smart invest the first paycheck you earned by blogging. Here are 8 Smart First Paycheck Investing Tips I can suggest. If you are using a free (or nulled) theme which is non-SEO Optimized and does not have many features, then your first investment should be to buy a new theme. MyThemeShop and Elegant Themes have some great SEO Optimized, fully functional themes available with an affordable price tag. And if you already have a good theme but your site is lacking certain functionalities then it is high time to add them using some plugins or by hiring someone. When starting our blog, we often start using free tools to save money as much as we can. But, the truth is we compromise on functionalities a lot. But when you have started making money off your blog, it is time to get rid of limitations and enjoy the complete features. You can also spend some bucks to buy new tools which would help you in growing your blog. Semrush is a must have tool for keyword researching and finding long tail and low competition keywords. Virtual Assistants are of great help especially when you want to do something technical and don’t want to mess with all those codes. Virtual Assistants are hired for a particular task and paid by per hour. It saves us a lot of money than hiring a full-time technical assistant. Whether you wanted to tweak your theme, create a new logo or design a cover page, you can get all these work done from virtual assistants. Freelancer, Fiverr, and PeoplePerHour are some of the best places to find VAs. It is understood that when you are making money, your site is growing and your traffic is increasing. When starting out, you must have bought the web hosting from a cheap web host, but you can’t use it any longer. Anytime your posts can go viral and bring thousands of unique visitors to your site. And your current cheap host won’t be able to handle the traffic, and your site will crash leading to loss of potential customers. If you are getting less than 1,00,000 page views per month, then Siteground (Special Discount Link – 60% OFF + Free Domain) and BlueHost are the most suitable hosts for you. If you have more traffic, then it is better to move to managed WordPress hosting like InterServer. Tip: Take this hosting quiz before finalizing your purchase. Remember the old days when you were out of money but wanted to try your hands on those expensive blogging tools? Giveaways by popular bloggers were the only hope you had to win and try expensive tools. P.S – I used to spend a lot of time in participating Giveaways, but I never won anything. Edit: I won the first giveaway of my life (iPage Web Hosting) from a fellow blogger. Read about it here. Sponsoring a giveaway has a ton of benefits. It brings new subscribers, followers, and social shares. You can sponsor any product whether it is a gift card, hosting, domain name or some physical product. If you are managing another work or working in a company and find it time-consuming to write contents yourself, then Ghost Writers are your best options. You can hire ghostwriters who will write contents for you on your given topic, and you can publish the article by branding your name. Although finding people who can write high quality and a standard article is a pain, some good sites like UpWork, ContentMart, and iWriter are here to make your search easier. If you are in Fashion, Ecommerce niche then running ad campaigns is an excellent way to drive more traffic and bring your blog in front of more targeted visitors. Running an ad campaign may not always result positively in the start, but once you know how to target customers and optimize ads, you will be earning multiple folds of your current income. Facebook Ads, Google Ads, Pinterest Ads and Instagram Shoutouts are some of the great ways to advertise. Now, if you were thinking I would only suggest you invest all your money in upgrading, promoting or growing your blog, then I am not. You must have worked tough to earn your first paycheck, isn’t it? Everyone need refreshment and refreshing your mind will motivate you to focus more on blogging. Invest some of your money to go on a mini vacation and enjoy the real laptop lifestyle you always wanted. But, take care of that Mini word before Vacation. And keep noting ideas and strategies which come in your mind during the holiday. So, these were some of the best ways I suggest to invest the first paycheck you earned by blogging. There are many other ways you can think of and don’t forget to share your idea can help other bloggers. Also, don’t forget to share this post with your friends and family and pin the below image. Thanks for the continued support.